This is the Baseball Display Cases category. 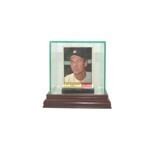 In this category, you will find single baseball display cases, double baseball display cases, triple baseball display cases, baseball display cases for 4, 5, 6, 12, 24, 36 baseballs and more. You will also find baseball bat display cases, baseball cap - hat display cases, batting helmet display cases, mini helmet display cases, baseball jersey display cases, baseball batting and fielding glove display case and more. We have desktop and wall mount display cases. Glass display case for a single trading card. Features a mirrored floor and back panel. wanted, simply leave that field blank. 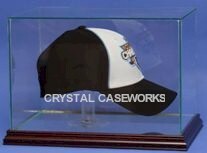 Glass display case for a baseball and trading card. Features a mirrored floor and back panel. 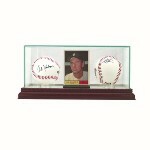 Glass display case for 2 baseballs and trading card. Features a mirrored floor and back panel. and a Walnut wood base.Price includes 1 free nameplate. The cover is all clear and the floor is mirrored so you can see the entire ball. clear real UV protected glass and mirrored back and floor so you can see the entire ball. Brass display stand designed to hold a single baseball. The ball sits on stands shaped like mini baseball bats. Also available for a golf ball or tennis ball. 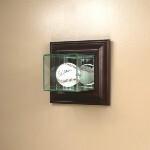 Wall mount single Baseball glass display case featuring a furniture grade wood frame and real UV protected glass and mirrored back. Includes 1 free nameplate. Inside dimensions are 4 x 5 x 4. Our unique hinged design allows for easy access. Mounting hardware is included. clear real UV protected glass. The base and back are also mirrored so you can see the entire ball. Includes 2 free nameplates. Additional nameplates are available. The text that you type into the engraving fields will be laser etched directly onto the glass. The location of the etching will be centered below each ball on the lower part of the front panel. If you would like the etching to be in a different location, or if you would like additional panels etched or a traditional engraved nameplate - plaque, please call or email us. base, mirrored back and real UV protected glass. Includes 2 free nameplates. Inside dimensions are 7 x 5 x 4. Our unique hinged design allows for easy access. 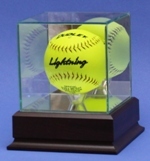 Wall mount double baseball glass display case featuring a furniture grade wood base, mirrored back and real UV protected glass. Inside dimensions are 7 x 5 x 4. Our unique hinged design allows for easy access. Mounting hardware is included. grade solid wood bases and optically clear real UV protected glass. The base is also mirrored so you can see the entire ball. Includes 3 free nampelates. Additional nameplates are available. 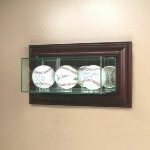 Triple baseball display case featuring a furniture grade solid wood base and optically clear real UV protected glass. The base and back are also mirrored so you can see the entire ball. Interior Dimensions 10" x 4" x 4". 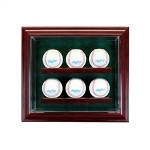 Wall mount triple baseball glass display case featuring a furniture grade wood frame, mirrored back and real UV protected glass. Interior Dimensions 10 x 5 x 4. Our unique hinged design allows for easy access. Mounting hardware is included. 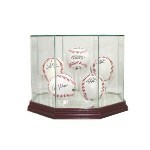 Glass octagon display case designed to hold up to 5 baseballs. This case features 5 riser tube ball holders. 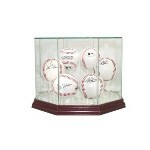 6 baseball wall mount glass display case. This display is similar to a traditional shadow box, but without the shadow. 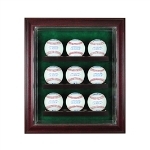 The other products that are out there keep the baseballs enclosed in a box. 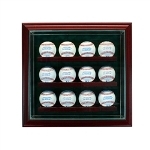 9 baseball wall mount glass display case. This display is similar to a traditional shadow box, but without the shadow. also mirrored so you can see the entire ball. 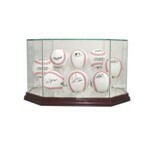 12 baseball wall mount glass display case. This display is similar to a traditional shadow box, but without the shadow. 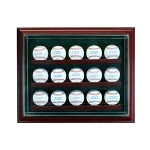 15 baseball wall mount glass display case. This display is similar to a traditional shadow box, but without the shadow. can see the entire bat. Includes 1 free nameplate. Additional nameplates are available. Baseball Bat display case featuring a different furniture grade solid wood base and real UV protected glass. Features a mirrored back panel. The base is also mirrored so you can see the entire bat. Interior Dimensions 36" x 4" x 4". 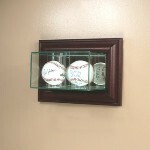 Wall mount Baseball Bat glass display case featuring a furniture grade wood frame and real UV protected glass. Also features a mirrored back. Inside dimensions are 36 x 5 x 4. Our unique hinged design allows for easy access. Mounting hardware is included. 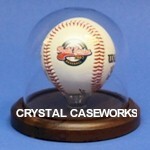 dimensions are approx 12"L x 8"W x 8"H.
Single softball display case round dome holds one regulation size softball. Featuring a walnut wood base and real UV protected glass. Includes 1 free nampelate. 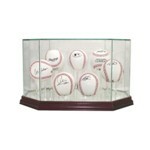 Interior Dimensions 5-1/2" x 5-1/2"
Softball glass display case has a wood platform base with a cherry or black finish. The floor is mirrored so you can see the entire ball. The ball sits on a custom ball stand. You also get your choice of either a clear or mirrored back panel. Comes with 1 free name plate. Engraving area is 6 x 4 so there is plenty of space. Inside display area is 5" x 5" x 5". Price includes up to 2 free nameplates. Price includes up to 3 free nameplates. Baseball bat glass display case, featuring a cherry wood base. The interior length of this case is 36". Price includes 1 free nameplate.